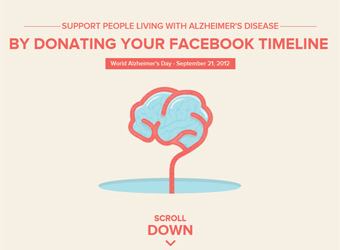 For last Friday’s World Alzheimer’s Day, Alzheimer’s Disease International created a Facebook app that erases all of the information in users’ Timeline temporarily to give people a taste of what living with Alzheimer’s is like. Adweek speculated whether the app is sufficient to jar users into a greater empathy for the disease or if the approach is too subtle. “Facebook profiles are such an intrinsic part of some people’s lives that ‘losing’ years of deeply treasured cyber-mementos, if only for a day, could provide at least of small taste of what Alzheimer’s patients endure,” AdWeek reporter David Gianatasio writes. The app was supported by a TVC that shows the struggles one woman faces in remembering everyday tasks, with Post-it notes dotted around the woman’s house to jog her memory. The spot ends with the heart-wrenching scene of the woman’s daughter visiting and having to use a Post-it note to identify herself to her mother.